I've received some private messages, but I can't seem to reply to them... I click on "submit message" but I get redirected to my inbox and it doesn't seem to send the message. Does the message really get send but I can't see it (if so, sorry for spamming someone inbox, I think I sent the same message 5 times)? Am I doing something wrong or it's an error? 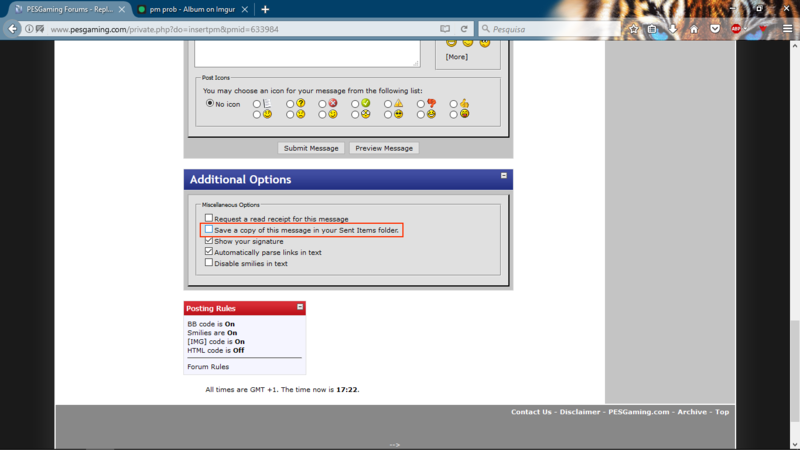 Check your sent items (click the drop down arrow next to 'Inbox' in your inbox), there are no issues as far as I know. I've sent you a PM to test, reply to me and I'll let you know if I got it. The "redirect" to the inbox always happens when you submit the message. I think they are working, i already got a response from another person, but I can't see the reply i sent in the sent items, but i know it's working. P.S. The messages I sent appear in set items, only the replies to other people message don't appear. New messages and replies should appear in sent items, is your reply to my PM not showing? I can only see my reply message when you reply to it, because it was quoted in your reply. It's easier to explain with pictures, if you want I can send them via pm. I've never actually noticed that, so I also feel dumb. If I Go Advanced on my profile it's ticked by default, so you must've unticked..... because I don't remember ever ticking it myself. Hey bro I couldn't send you a private message. Is there something wrong or is it maybe my browser?